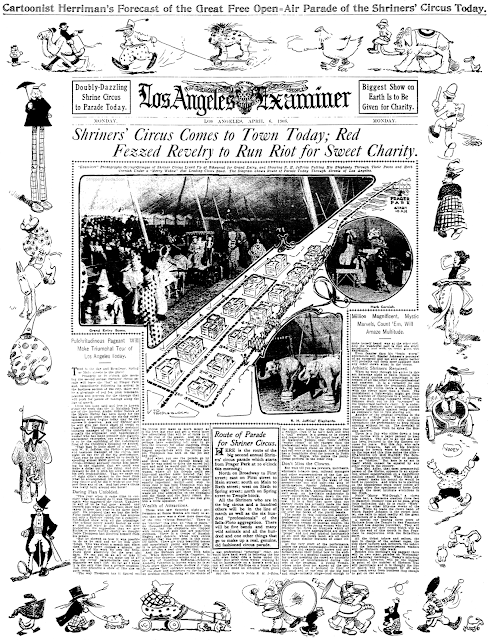 Monday, April 6 1908 -- An impressive full page spread, featuring a Herriman-drawn parade around the border, greets Examiner readers this morning. You can bet this page had every kid in town screaming bloody murder at the 'rents to go see the Shriners' Circus parade make its way through the city. Note that the circus parade reaches its conclusion at Prager Park. The magnificent Shrine Auditorium, well-known venue of the circus when in L.A., would not open its doors until 1926. 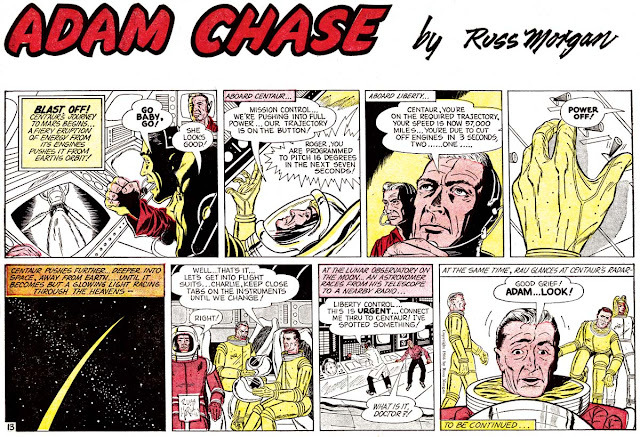 Adam Chase strip #13, originally published August 28 1966. For background on the strip and creator, refer to this post. Donald William Dean was born in Toledo, Ohio on February 10, 1913. His birth date was found at the Social Security Death Index, and his birthplace was determined from census records. According to his father’s World War I draft card, they lived in Toledo at 372 Hamilton. In the 1920 U.S. Federal Census, Dean was the oldest of two sons born to Ira and Bernice; his name was recorded as “Billy D.” His father was a machinist at an automobile factory. Their home in Toledo was at 2265 Kent Street. 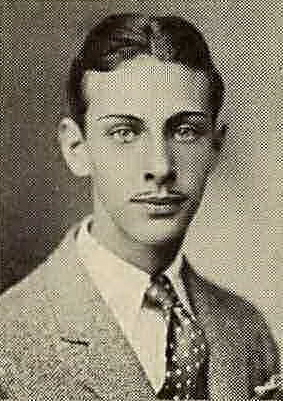 Dean attended Edward Drummond Libbey High School; the 1928 and 1929 yearbooks, The Edelian, listed his name as Billy Dean. One of his classmates was John Woggon, the third of four brothers (Elmer, Bill and Glenn), all newspaper cartoonists. According to the 1930 census, Dean, his father and brother resided at 1309 Harvard Boulevard, the home of his father’s brother-in-law. 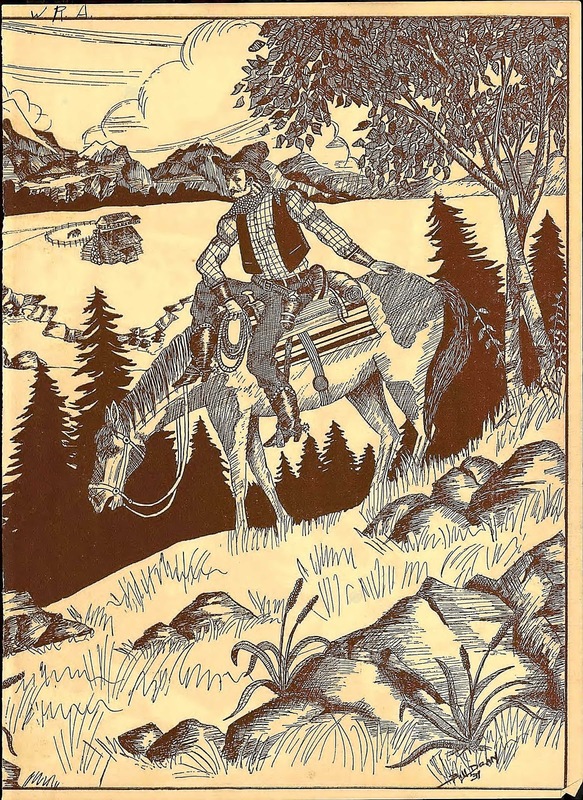 Dean was known as Bill in the 1930 and 1931 Edelian; in the 1930 yearbook he was a staff artist and his artwork was featured on the endpaper and humor section page. Also, he was a member of the school’s Utamara Art Society, which was named after the Japanese printmaker, Utamaro. Not long after graduating high school, he married Marjorie. ...Don Dean, its creator, credits Charles V. McAdam, president of the McNaught Syndicate, with being the guiding light of the strip. In November 1936 Elmer Woggon created The Great Gusto which was later renamed Big Chief Wahoo. Dean was one of the ghosts on the strip but exact dates are not known. 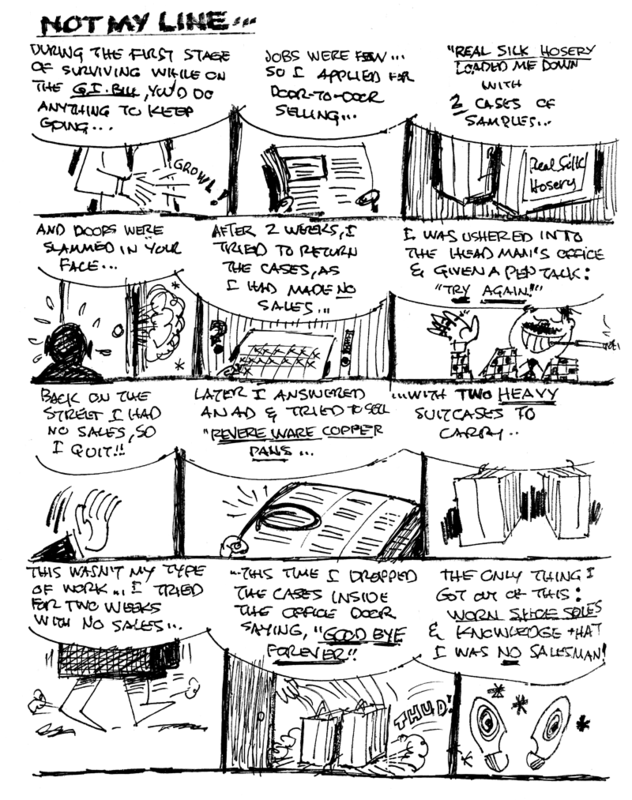 The Glyph!, Fall 2006, printed Ed Black’s Cartoon Flashback: “…Elmer created a short-lived aviation comic strip, Skylark. Then he created another strip, Big Chief Wahoo, in 1936 and sold it to Publishers’ Syndicate in Chicago. As time went on, Elmer asked Bill to help him out, so Bill came on and did the lettering and the backgrounds. Another cartoonist, Don Dean, came aboard in the small, cramped office in a downtown building that served as their studio. Dean was doing the strip Cranberry Bog [sic], and for Archie Comics also drew Senor Siesta….” The Cranberry Bogg daily ended July 30, 1949, and the Sunday, in the Chicago Sun-Times, on April 25, 1948. There is scant information on Dean in the following decades. The family tree said his father passed away in 1954. Twenty-five years later his wife died August 1, 1979, according to Ohio Deaths at Ancestry.com. Dean passed away October 27, 1984, at the St. Vincent Mercy Medical Center in Toledo, as recorded at Ohio Deaths. An obituary has not been found. Thank you for writing about our grandfather, Donald Dean. While your critic is very harsh given the fact that he was very young at the time he was doing Cranberry Boggs. His ambition and ability to obtain this level of job at such a young age was an attribute to his talent. He hadn't grown into his own style yet and obviously taking direction for others. Such was the immense popularity of Li'l Abner in the 1940s that many syndicates tried to ride on its coattails. One of the most slavish of these imitators, and also perhaps the most awful, was McNaught Syndicate's entry, Cranberry Boggs. Don Dean's name was on the masthead, but the cartoonist made sure to place blame where it belonged; he was always very careful to give syndicate president V.V. McNitt full credit as the guiding light on the strip. As hired hand on the imitation Abner, I don't know if Dean wrote any of the tripe (my hope is no) but it is amazing in its ineptitude. Other than moving the venue of the strip from the hills of Kentucky to the shores of some New England state, everything is pretty familiar. 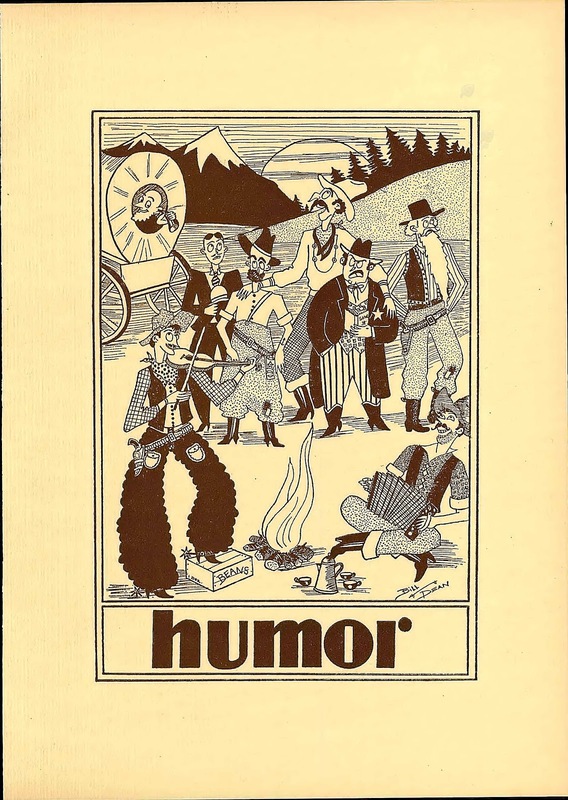 We have the star, a dim-bulb lummox (nod to originality -- he is skinny), his colorful backwoods family (nod to originality -- they are his grandparents rather than parents), and the gorgeous gal who lusts after him (nod to originality -- her shorts aren't cut-offs). All the parts are in place for a dreary Li'l Abner rip-off, but Cranberry Boggs manages to amp up the awfulness with amazing inept writing. There's no shame in not being able to measure up to Al Capp, one of the greatest American satirists of the 20th century, but the writer of Cranberry Boggs seemed to be unfamiliar even with the concept that Li'l Abner was a humor strip. What I've read of Cranberry Boggs, and my stomach can only take so much so forgive me if I focused on a bad patch of the strip, is more hillbilly soap opera than humor. The writer didn't seem to have a clue how to write funny. Apparently the thinking was that if the characters are goofy looking and the dialogue is stilted hillbilly-ese, that makes the strip funny. Because beyond that there just isn't much funny going on. I mean, there doesn't even seem to be a concerted attempt to write funny material. I have to stress that I don't think Don Dean should be held fully accountable for this travesty. He was a hired gun, faced with the impossible task of duplicating one of the greatest strips of all time. On the plus side, at least, the art is pretty attractive, and Dean could definitely draw the shapely gals, which may well be what got him this job in the first place. I can only imagine how depressing it must have been for Dean to work so hard on a strip this derivative and badly written. What's really amazing is how long he was stuck doing this dog. Cranberry Boggs debuted on January 8 1945, and lasted almost five years, ending on July 30 1949. The Sunday seems to have died a bit earlier, on April 25 1948. 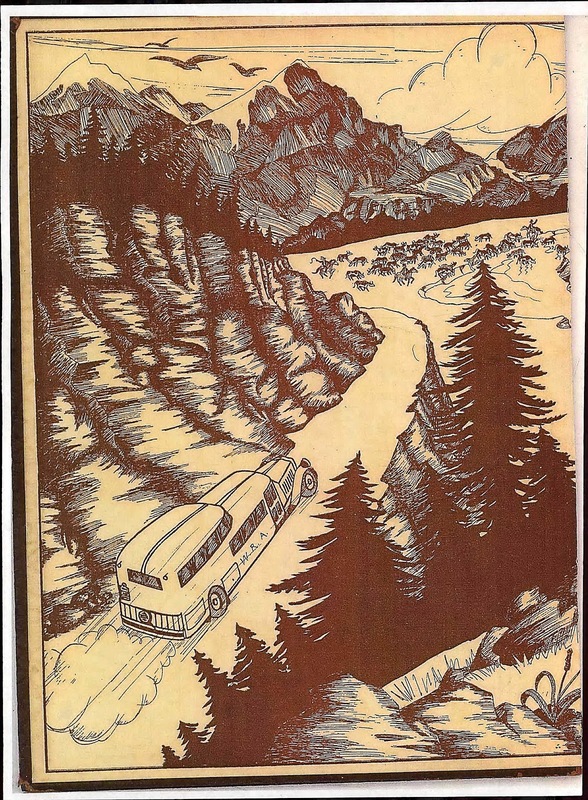 According to Alberto Becattini, Dean at least had a little company in purgatory -- he had Jim Seed doing the inking on the feature. Allan "Sols" Salisbury, an Australian cartoonist, has a knack for getting into the U.S. newspaper market -- sometimes successfully, sometimes, well, not so much. Fingers and Foes is definitely the latter case. Although I can find no exact information about its run in Australia beyond that it began there in 1974, it seems like the Australian and U.S. runs might have been concurrent. In the U.S., Field Enterprises picked up the strip for a Sunday and daily run beginning March 18 1974. The strip was about a group of mobsters known as the League of Disorganized Crime, led, of course, by a guy named Fingers, hence the name of the strip; and their foes, including a cop, a superhero and a newspaper reporter. While not a definite surefire hit, the strip did have appeal. However, a mere three and a half months later, the strip appears to have ended in the U.S. The latest I've been able to find it is June 29. Why the ridiculously abbreviated run? Good question. What I've read of the strip indicates that it translated well for a U.S. audience, a common lack in foreign strips. 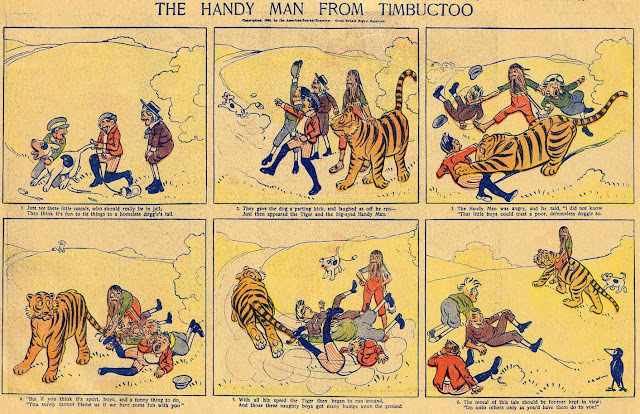 In fact, the strip's language and references bespeak either a cartoonist steeped in American culture or a very creative and hard-working American editor. Could it have been the unfortunate choice of the name The Iron Man for the strip's superhero? Surely a cease and desist letter from Marvel Comics would have simply required a new name for that character, not the cancellation of the strip entirely. No, my best guess is that the communication hurdles between a cartoonist in Australia and his American syndicate may just not have worked out, and the strip not being a big immediate success might have made it easy to just say "ah, to heck with it." Am I right? Perhaps Sols, who as far as I know is still with us, will happen upon this post and give us the straight skinny. Once Carl "Bunny" Schultze came up with Foxy Grandpa, he seemed to have all but scraped his idea barrel clean. Even when he created a new series, a rare event, as he did with The Handy Man from Timbuctoo, the strip ended up following the same general plot as a Foxy Grandpa episode. The series initially seemed to have really interesting possibilities when it debuted on August 14 1904 (top sample) in Hearst's New York American. A mysterious man, so hairy that only his eyes peek out from under the thatch, along with his pet tiger, emerge from the ocean onto an American beach. 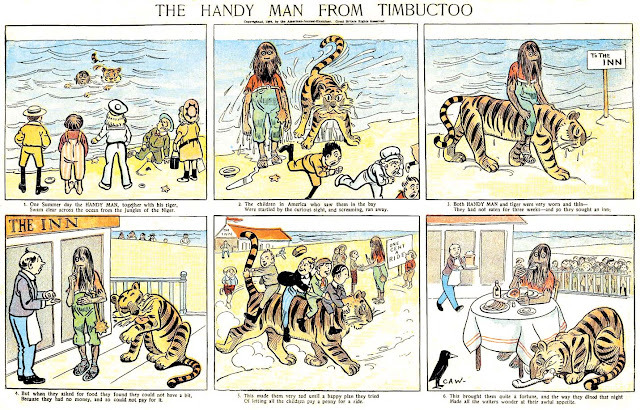 According to the title they have presumably just swum over from Africa -- never mind that Timbuctoo is over a thousand miles inland, or that tigers are not native to Africa at all. Such niggling details aren't important, because the series immediately devolves into the familiar plot where kids try to pull a prank, and the handy man and his tiger, as stand-ins for Foxy Grandpa, turn the tables. Ho hum. Schultze signed this strip as CAW for some reason. In my book I contended that, based on what I'd seen of the strip, I didn't think that CAW was Schultze. That was based on looking at these strips on microfilm, far from optimal for art spotting. Seeing these samples from Cole Johnson, though, I can now see that they are indeed Schultze, and so retract my earlier statement. That leaves open a mystery as to why the cartoonist elected to do the strip under a pseudonym. Perhaps, and this is just a wild guess, he was assisted on the series and didn't feel he should take credit -- I do note on some strips a certain lack of finish that might go along with that theory. The series sputtered out quickly, the last episode under the title running on November 6 1904. 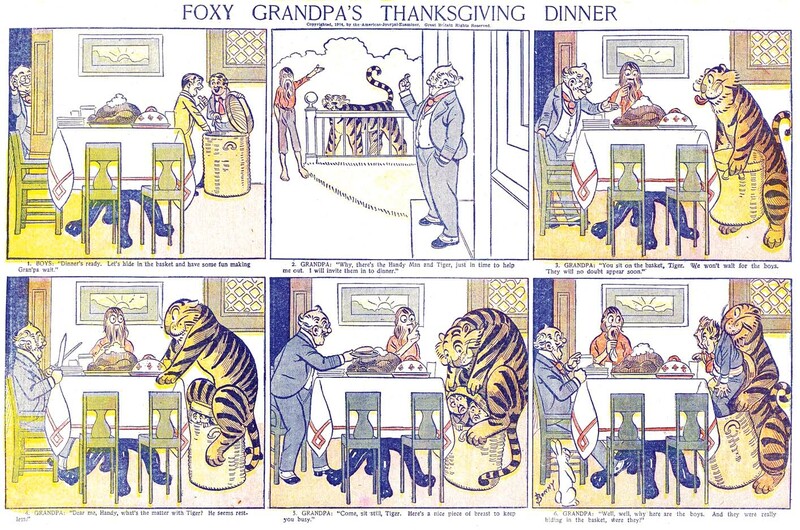 However, Schultze brought the handy man and his tiger into the Foxy Grandpa strip for two episodes, on November 13 and 20 (see bottom sample), before banishing the pair back to the middle of the Sahara. Didn't an ad comic of sorts appear in the Hearst sections in 1904, also drawn by "CAW"? Perhaps this was a Schultze ghost. Cole sent me a Foxy Grandpa ad strip from 1904, but it wasn't signed CAW. It does, however, have that same vaguely unfinished look about it. Schultze's style certainly, but just slightly rough in the details. I could easily believe that the roughness is because Schultze didn't have his heart in it (much like with the Handy Man strip).